This weekend saw the christening of the largest Italian-flag ship, the €550 million 3,708-berth Costa Diadema, in Genoa, as well as the opening of a second Costa cruise terminal in Savona. Meanwhile, in Germany, the owners of the Astor have followed the owners of the Deutschland into insolvency, although in both cases it is claimed that the ships will continue to operate. Finally we have a look at a couple of interesting ships’ names as related to where they will be based from next year. 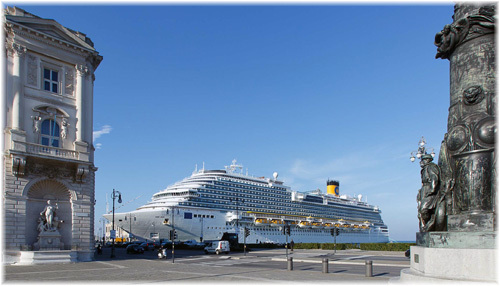 The 3,708-berth 132,500-ton “Dream” class ship Costa Diadema was ordered in October 2012 and on entering service this weekend became Costa Cruises’ flagship and the largest ship to fly the Italian flag. She is the 44th cruise ship built by Fincantieri since 2002 and the twelfth for Costa Cruises. With the usual distinctive Costa funnel to set her apart, she was launched at Marghera in November 2013 and christened on Friday at Genoa’s historic Stazione Marittima, not far from Costa Cruises’ headquarters. The new ship was modelled after Carnival Dream (2009), Carnival Magic (2011) and Carnival Breeze (2012), also built by Fincantieri. Costa Diadema’s main new external feature is the large promenade that stretches 1,640 feet, completely around deck 5, and is lined with bars and restaurants to create a Mediterranean summer mood. Palermo travel agent Carolina Miceli was chosen to cut the ribbon that released a jeroboam of special label sparkling spumante against her bow. The celebration dinner that followed featured a menu by Michelin-starred chef Fabio Cucchelli and fireworks capped the festivities. At the celebration, Costa ceo Michael Thamm also toasted the ship’s interior architect, Joe Farcus, who has been working on Costa ships since 2010. The presentation was also attended by Carnival Corp & plc chairman Howard Frank and ceo Arnold Donald, who arrived straight from the Regal Princess’s naming in Fort Lauderdale on Wednesday. In an indication of where Costa’s markets lie these days, maids of honour were in attendance from Germany, France, Spain and China, but not the US or UK, markets where Costa used to play a much bigger game in the days before Carnival. In Germany, of course, Costa Cruises Group now controls Aida Cruises and in France it took over the former Paquet, while in Spain it is busy absorbing what is left of Iberocruceros into the main Costa brand. Costa is also a leader in China, where the 3,000-berth Costa Serena will become Costa’s third ship to be based in China when she moves there next year to join the 1,928-berth Costa Victoria and 2,112-berth Costa Atlantica. Just under half of the new ship’s cabins have private balconies and 63% are outside, which leaves the 37% of inside cabins that allow Costa to offer mass market lead-in fares that drop to as low as $499 per person in January and $449 in February. In part of a double ceremony, the Costa Diadema sailed over to nearby Savona on Saturday morning for another celebration, this time the inauguration of the new 9 million cruise terminal at that port, the second for Costa. 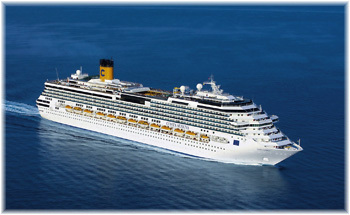 Costa Cruises plans 236 calls at Savona in 2015, involving more than a million passenger movements. From now until the end of the 2015 summer season, Costa Diadema will sail weekly from Savona for Marseilles, Barcelona, Palma, Naples and La Spezia. Embarkation for the full 7-night cruise is offered from any of Savona, Naples or La Spezia, as well as from Marseilles for the French market. 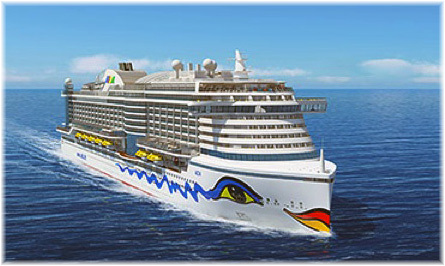 The next Carnival Corp inaugurations, both scheduled for 2015, will be P&O’s 3,647-berth Britannia, a follow-on from Royal and Regal Princess, and Aida Cruises’ 3,300-berth AidaPrima, which is the first of two ships of a totally new design coming from Mitsubishi Heavy Industries in Japan. Last week, we brought you news that the operating company for the 552-berth cruise ship Deutschland had filed for insolvency, with MS Deutschland Beteiligungsgesellschaft (MSDB) submitting an application to the courts on October 29. The ship is scheduled for drydocking this month, while the restructuring of MSDB and Reederei Peter Deilmann started immediately. MSDB said it aims to secure financing for the ship’s overhaul, and hopes to have the vessel depart on its scheduled world cruise in December. Callista Private Equity, the majority stakeholder in MSDB, has appointed Wolfram Günther, managing director of One Square Advisors, as chief restructuring officer. Details on the restructuring will likely be presented at a bondholders’ meeting in Munich this week and announced on Thursday. Günther noted that while historical bookings for the Deutschland have been weak, those for 2015 are strong, something that it is hoped will assist the restructuring. Currently, the Deutschland is on an 11-night itinerary through the Mediterranean to Lisbon before the scheduled overhaul. The first cruise after drydocking is to leave Cadiz on December 7 for the Canary Islands. 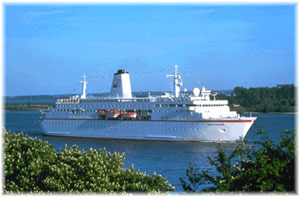 Deutschland, the only cruise ship flying German flag, was delivered in 1998 to Reederei Peter Deilmann. The luxury ship ran into trouble following the death of owner Peter Deilmann in November 2003. His daughters’ efforts to continue operating the company were unsuccessful and its river operations were closed in 2009. Further restructurings and changes of ownership have followed since. Just a week and a day after the news of the Deutschland, Premicon Hochseekreuzfahrt GbmH & Co. KG MS Astor (PHMSA), the fund that owns the 590-berth Astor, which is operated by UK-based Cruise & Maritime Voyages (CMV), filed for insolvency in Bremen. The owner of the Astor is part of the Munich-based Premicon group, which sold Trans Ocean Cruises to Cruise & Maritime Voyages earlier this year. CMV operates the Astor together with three river cruise vessels through a German-based ship management company. As with the Deutschland, Astor will continue to operate normally despite the problems at its owner company. Cruise & Maritime Voyages have confirmed that the Astor’s operations are secure despite the fact that PHMSA has declared insolvency in Germany. The Astor left Tilbury on Wednesday en route to Cape Town and Fremantle to start her second season in Australian waters next month. CMV has full management of the vessel, including all operational and management functions. It is understood that CMV saved the ship from arrest some weeks ago, by paying some bills, including bunker costs and crew pay, and that these payments will be charged against the charter rates CMV is paying for the winter season. The Astor’s problem is apparently that bookings on the German market were less than projected by new booking agents this summer and replacement agents have now been appointed. 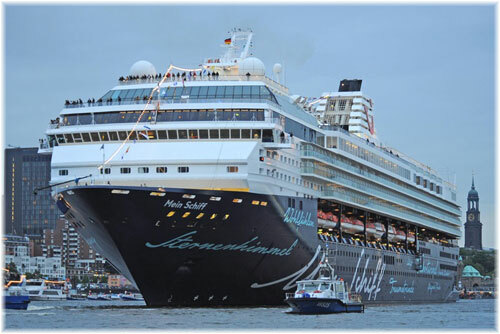 With both Aida Cruises and now TUI Cruises growing at a pace in the German market it will be interesting to see how these much smaller ships cope in future. The weekend papers have been full of news that China will employ quantum encryption in order to make its newest computer network between Beijing and Shanghai completely impenetrable to hackers. How odd it seems therefore that Royal Caribbean International has decided to base its new Quantum of the Seas year-round in Shanghai from next year. The new network will largely be used by ICBC, the world’s largest bank, whose ICBC Leasing division has recently announced that it has agreed an $800 million financing package with Silversea so the latter can build three new cruise ships. 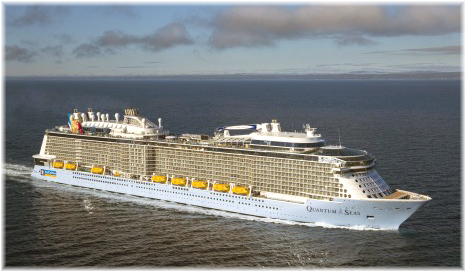 At the same time, Royal Caribbean will be basing Quantum’s 4,180-berth sister ship Anthem of the Seas in the UK. Although the anthem most passengers will think of will more likely be God Save The Queen or Rule Britannia rather than Beethoven’s’ Ode to Joy, the anthem of Europe, the name is more suitable than that of the ship she replaces. The name of the 3,634-berth Independence of the Seas definitely had more of an American ring to it. Some time back, we also mentioned that one cruise line had an executive that held the title of Vice-President of Passenger Experience, in charge of on board revenue (as many of these experiences now have to be bought). Now, we hear that the UK supermarket chain Tesco has an executive called Head of Impulse Buying. 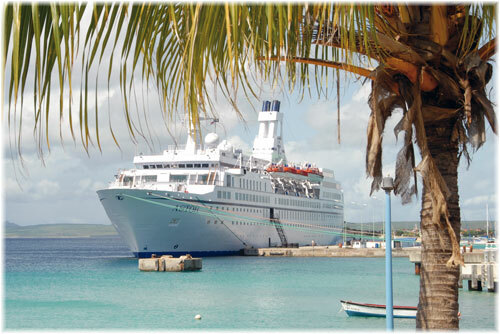 Perhaps the cruise line and the supermarket could learn a few things from each other.